My company, Radar Networks, is coming out of stealth this Friday, October 19, 2007 at the Web 2.0 Summit, in San Francisco. I'll be speaking on "The Semantic Edge Panel" at 4:10 PM, and publicly showing our Semantic Web online service for the first time. If you are planning to come to Web 2.0, I hope to see you at my panel. (PRWEB) October 15, 2007 -- At the Web2.0 Summit on October 19th, Radar Networks will announce a revolutionary new service that uses the power of the emerging Semantic Web to enable a smarter way of sharing, organizing and finding information. Founder and CEO Nova Spivack will also give the first public preview of Radar’s application, which is one of the first examples of “Web 3.0” – the next-generation of the Web, in which the Web begins to function more like a database, and software grows more intelligent and helpful. Join Nova as he participates in “The Semantic Edge” panel discussion with esteemed colleagues including Powerset’s Barney Pell and Metaweb’s Daniel Hillis, moderated by Tim O’Reilly. In recent months we have witnessed a number of social networking sites begin to open up their platforms to outside developers. While this trend has been exhibited most prominently by Facebook, it is being embraced by all the leading social networking services, such as Plaxo, LinkedIn, Myspace and others. Along separate dimensions we also see a similar trend towards "platformization" in IM platforms such as Skype as well as B2B tools such as Salesforce.com. If we zoom out and look at all this activity from a distance it appears that there is a race taking place to become "the social operating" system of the Web. A social operating system might be defined as a system that provides for systematic management and facilitation of human social relationships and interactions. Today I have not seen any single player that provides a coherent solution to this entire "social stack" however Microsoft, Yahoo, and AOL are probably the strongest contenders. Can Facebook and other social networks truly compete or will they ultimately be absorbed into one of these larger players? I've been reading some of the further posts on various blogs in reaction to the Markoff article in the New York Times last Sunday. 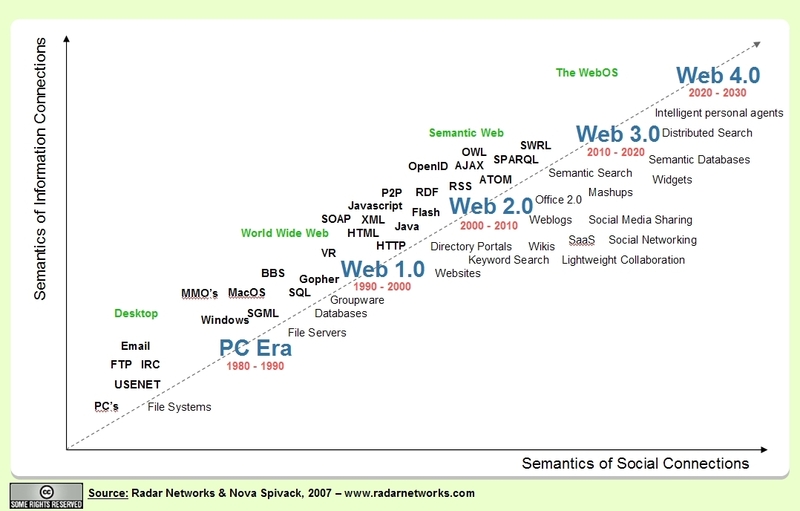 There is a tremendous amount of misconception about the Semantic Web-- as evidenced for example by Ross Mayfield's post recently. Ross implied that the Semantic Web is about automating the Web, rather than facilitating people. This is a misconception that others have taken to even further extremes -- some people have characterized it as an effort to replace humans, replace social networks and social software, etc. etc. That is simply NOT at all correct! Quite the opposite in fact. The Semantic Web is just a way to augment and improve the EXISTING Web and all the existing relationships, groups, communities, social networks, user-experiences, apps, content, and online services on it. It doesn't replace the Web we have, it just makes it smarter. It doesn't replace human intelligence and decision-making, it just augments human thinking, so that individuals and groups can overcome the growing complexity of information overload on the Web. Following in the footsteps of Douglas Engelbart's pioneering work, SRI has announced the upcoming open-source (LGPL) release of Open IRIS -- an experimental Semantic Web personal information manager that runs on the desktop. IRIS was developed for the DARPA CALO project and makes use of code libraries and ontology components developed at SRI, and my own startup, Radar Networks, as well as other participating research organizations. IRIS is designed to help users make better sense of their information. It can run on it's own, or can be connected to the CALO system which provides advanced machine learning capabilities to it. I am very proud to see IRIS go open source -- I think it has potential to become a major platform for learning applications on the desktop. IRIS is still in its early stages of evolution, and much work will be done this year to add further functionality, improve the GUI and make IRIS even more user-friendly. But already it is perhaps the most sophisticated and comprehensive semantic desktop PIM ever created. If you would like to read more about IRIS, this paper provides a good overview. Congratulations to the team at SRI for reaching this important milestone! I am playing around with the barely functional live beta of Google Base that just launched. There's not much there, but what I do see is interesting. At the very least this is going to be serious competition for Ning. Beyond that it may compete with Craigslist and other classifieds and events listing services. It's an interesting first step. But I also see several potential major problems with the approach that Google Base is taking -- in particular there does not seem to be any notion of real semantics under the hood. Is the data at least available as RDF? But even if it is -- how will it be integrated as everyone starts creating their own types? From what I can see, without data type standards, Google Base is likely to develop into billions of non-integrated data record types -- an unuseable "data soup." Searching across these non-normalized records will be next to impossible without an ontology or some form of higher-level data integration. I wonder if the folks at Google have thought this through? At my own startup, Radar Networks, we've spent several years exploring these issues in our own work and in our DARPA work -- all of which is centered around making use of richer semantics in applications. And we've built a working system that makes this much more practical. We believe that "the world wide database" requires the Semantic Web as its key enabling infrastructure. The technologies of the Semantic Web (RDF/OWL principally, and perhaps XML Topic Maps as well) enable a truly interoperable, open data exchange layer. From what I can see neither Ning nor Google see this, but they are interesting first steps at least. If anyone from Google or Yahoo is reading this, I would be interested in speaking further with you. Update: Google has taken Google Base offline for a while it seems. Here is a good article from IBM that provides decent, not-overly-technical, overview of the technologies that make up the Semantic Web, and the value they offer. Great news! Radar Networks, the venture I've been building, has received its first round of outside funding from Vulcan Capital. We are heavily in stealth mode. I just read this really cool idea about how to design a programming language for the global brain -- think of it as grid computing, but where some of the agents in the grid are humans and others are computers, working together to solve problems. I've had similar ideas to this over the years, for example the use of collaborative networks to mark up and tag content on the Semantic Web, as well as various forms of expertise referral networks. What I like about this new proposal is that it suggests an actual language for writing global mind programs. That's a new angle. Brilliant. I've been thinking about different types of communities recently. Two forms of community that are often discussed are "communities of interest" where the members share a common set of interests (e.g. a community of people interested in Japanese culture), and "communities of practice" where the members share a common set of skills (e.g. a community of marketing professionals). To these I would add a third type called a "community of purpose," where the focus is on a shared goal (e.g. a political activist community or a community collaborating on a common project). Most existing community tools today are either focused on building communities of interest or communities of practice. But I am more interested in creating tools that help people create more productive communities of purpose. To do this we need to merge the functionality of groupware and knowledge management with emerging community tools for social networking, blogging, and wikis. Microsoft announced that they are buying Groove Networks today, in a deal that has gotten some buzz. But I don't really think it's very significant given that Microsoft already had a large equity stake in Groove and has linked them into their apps for more than a year now. I've always been puzzled by the seeming contradiction between Groove and Netmeeting being in the same company as they are directly competitive offerings. But then again, I guess Microsoft can afford to not worry about details like that. In any case, I don't think this deal will make much of a difference for either company. First of all I know Clay Shirky, and he's a good fellow. But he's simply wrong about his claim that "tagging" (of the flavor that is appearing on del.icio.us -- what I call "social tagging") is inherently better than the use of formal ontologies. Clay favors the tagging approach because it is bottom-up and emergent in nature, and he argues against ontologies because pre-specification cannot anticipate the future. But this is a simplistic view of both approaches. One could just as easily argue against tagging systems because they don't anticipate the future -- they are shortsighted, now-oriented systems that fail to capture the "big picture" or to optimally organize resources for the long-term. Their saving grace is that over time they do (hopefully) self-organize and prune out the chaff, but that depends both on the level of participation and the quality of that participation. Change This, a project that helps to promote interesting new ideas so that they get noticed above the noise level of our culture has published my article on "A Physics of Ideas" as one of their featured Manifestos. They use an innovative PDF layout for easier reading, and they also provide a means for readers to provide feedback and even measure the popularity of various Manifestos. I'm happy this paper is getting noticed finally -- I do think the ideas within it have potential. Take a look.